Whether or not you’ve seen Niagara Falls, chances are your life has been affected in some way shape or form because of it. Indeed, the granddaddy of the waterfalls in North America has played a pretty critical role in the electricity industry from its production to its delivery to the various ways it has been regulated and controlled. It has also set an example of how scenic assets could be shared between countries as well as provide an example for conservationists arguing why some places should be set aside to allow Nature to thrive. 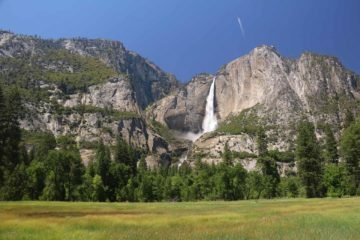 After reading this article you’ll come to see that this waterfall is more than just a pretty scenic attraction. Around the time when Niagara Falls had already become a major tourist attraction in the Union and was on the verge of changing the electricity industry in profound ways, the Western United States was developing rapidly as part of the country’s expansion (it’s Manifest Destiny). During the course of this expansion, visionaries like John Muir started to see Nature (like giant Sequoias, granite valleys, thermal pools and geysers) needing protection from the exploitation of man. 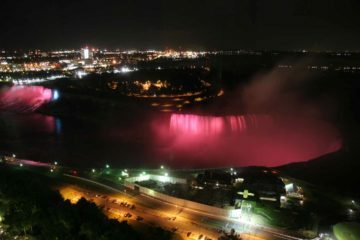 Such exploitation was clearly seen at Niagara Falls where hustlers and industrialists either fleeced (i.e. ripped off) tourists to visit the attractions or built mills and eventually power plants to siphon away waters that once flowed vigorously over the brink of the falls. Even though Niagara Falls eventually struck a balance between development and tourist attraction (whether successfully or not depends on your point of view), Muir and many others envisioned places that are to be left alone; to be as Nature intended. Such places included the yet-to-be-protected Yosemite Valley and the Mariposa Grove of Big Trees. Others foresaw similar protections needed for “Colter’s Hell,” otherwise eventually known as Yellowstone. 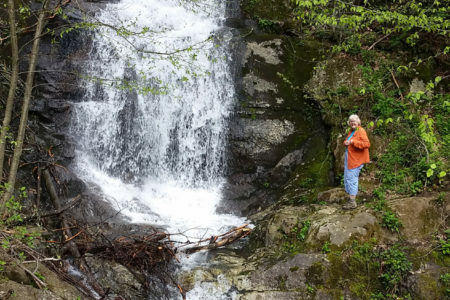 For the visionaries and soon-to-be-conservationists, the falls represented what happens to Nature in a compromised state when individuals try to exploit the attraction for commercial and/or industrial gain. It had set the precedent and became useful for the visionaries (who would eventually become famous conservationists we know today) to point out as an example of what might happen to places like Yosemite and Yellowstone if this exploitation were not prevented as was the case at Niagara Falls. So through the visual art and writings of contemporaries at the time (who saw what Muir and many others even before him saw), the word spread and the movement to protect these fragile sanctuaries as uniquely American icons gathered steam. 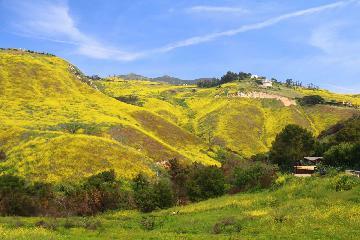 Eventually, this caught the attention of some policy makers who managed to push laws that would eventually set such lands aside for government protection as public lands for the benefit of the common people (an unprecedented move by any institution at the time) – albeit with little fanfare; at least lacking that of say the Declaration of Independence. Such was the the progressive politics manifested in Yosemite being set aside as a California state park in 1864 and Yellowstone being gazetted as a National Park in 1872 (as Wyoming, Idaho, and Montana were still territories and not states; a perhaps fortunate inadvertent consequence of the notion of a National Park and why it wasn’t a Wyoming State Park). Later on, even presidents had gotten into the act with visionaries like Benjamin Harrison (who gazetted Yosemite as a National Park in 1890), Theodore Roosevelt (who resisted the special interests and politicians seeking a way to exploit the new National Parks by establishing numerous National Monuments), as well as Franklin Delano Roosevelt (who was paraplegic yet signed the Wilderness Act in 1964). Indeed, if it wasn’t for Niagara Falls setting the example for communicating what exploitation and commercialism looked like, the National Parks of the Western United States might’ve been totally different than the grand and wild parks we’ve come to know. Today, the National Parks have become one of (if not the) best ideas to come from the United States . It has now been copied by other countries around the world as well as setting the precedent for land management that everyone can share as well as pass down to future generations. 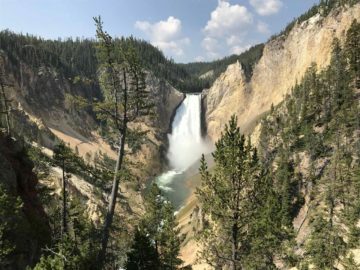 Sure there are ongoing struggles and the definitions of what it means to be a National Park as well as how to manage it continue to evolve today. 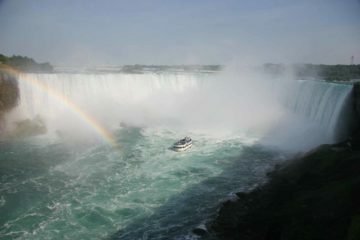 But it was the lessons learned from Niagara Falls that allowed such fortunate developments to occur. And as a result, we’re allowed (nearly 150 years later) to enjoy the fruits of their struggles and their vision, and that we must now continue in order to ensure future generations get to enjoy them, too. 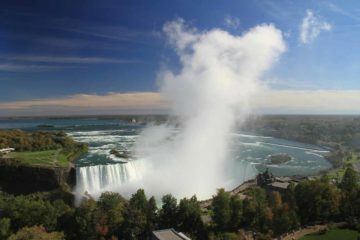 To see the role of Niagara Falls in electricity, we have to go back to electricity’s humble beginnings. Most of us know that Thomas Edison was credited with the invention of the incandescent light bulb. It was a technological achievement that ultimately changed the way we lived as our activities started to encroach well beyond sunset. However, did you know that Edison almost undermined the electricity revolution by championing the DC electric current for electricity networks? DC current (or “direct current” as opposed to AC current or “alternating current”) pertains to the flow of electrons directly from the source (like a battery) to the load (like a light bulb). You can kind of think of it like water flowing (like the current) from a reservoir (the source) high up on a hill and streaming downhill in a channel or creek towards a waterwheel (the load), where the force of the moving water turns the wheel and does work for you. If you were to look at a DC current on an oscilloscope (which displays voltage as a function of time), it would be more or less a straight line. Ever the entrepreneur and inventor, Edison sought to leverage his patents and control the electricity delivery (transmission) to customers needing to light up the night without noxious and staining fumes from gas lamps or candles (see how the power grid for transmission and distribution of electricity works). However, DC has its drawbacks as it tended to be limited in range as it was susceptible to energy loss (as heat) as it moved across the wires carrying the electricity (wires could be modeled as resistors, which generate what’s called Joule heating when current passes through it). Many of the clients who employed DC had to be located within one mile of the DC generators as a result. The voltage was also low voltage since Edison positioned it as “safe” and worry-free from electrocution. George Westinghouse and Nikola Tesla (who ironically was Edison’s secretary) challenged Edison and championed AC current. AC was not as limited by long distances so it was possible to carry electricity generated at Niagara Falls to as far as New York City! AC pertains to the alternating direction of flow of electricity from source to load. Periodically, the current moves in one direction, then flows in the opposite direction. If you were to look at an AC current on an oscilloscope, you would see a sine wave wiggling about zero volts in the vertical middle (i.e. the mean or average). It turned out that AC had many benefits and it allowed engineers to capitalize on breakthroughs at the time. This included Tesla’s induction motor (which exploited Faraday’s Law to convert magnetic fields into an AC electrical current – the basis of most generators today) as well as William Stanley’s commercial transformer (which allowed the ability to “step-up” or “step-down” AC current – the basis for transmission of electricity over long distances and overcoming line losses) among others. Edison tried to villify AC as dangerous. He even encouraged capital punishment to use AC for electric chairs to make the public associate AC with death and thus turn to Edison’s “safer” DC. After several years of fighting a public relations, legislative, financial, and technological battles, it turned out that Niagara Falls would play a crucial role in tilting the battle of AC versus DC in favor of AC. The falls was like the scene for the climax of the epic battle between AC and DC. Both camps saw the powerful waterfall as a means to demonstrate the superiority of one technology over the other. 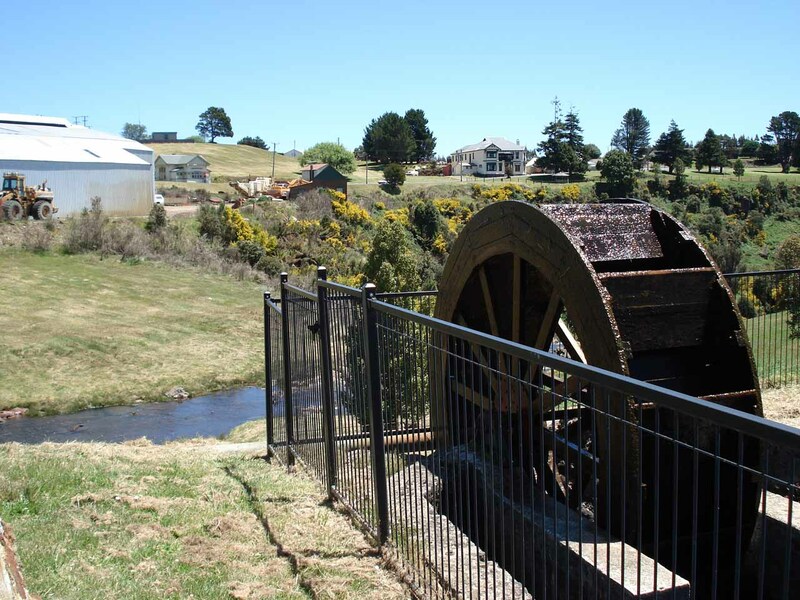 The stage was set for numerous power companies to try to divert water upstream from the falls and route them to turbines which in turn generated the electricity. Edison’s limited range DC meant customers had to be close to the falls to attain the benefits of the DC generators he championed. This is the basis for what’s known as distributed generation, where users had to be located close to the source of the power though you could have multiple generators each serving a localized community in a de-centralized network. Meanwhile, the Tesla/Westinghouse camp were able to directly use the AC generated by the turbines spun by the force of the Niagara River diversions, step up the voltages with a transformer (up to hundreds of thousands of volts), send it long distances (to Buffalo nearly 30 miles away and eventually to Manhattan where there’s Broadway and Wall Street), and step down the voltages with a transformer to a more usable form for lights and eventually other inventions to come like machines (for manufacturing), radios, televisions, calculators, etc. While the hydroelectric schemes at Niagara Falls weren’t the first to demonstrate Tesla’s generation motors or that it was possible to use hydro for electricity, it was the first of its kind for industrial use. Thus, the stage was set for the adoption of AC, which eventually paved the way for energy monopolists (like Samuel Insull), federal involvement in regulating (and in many cases enhancing monopolies) of electricity, standardizing the electricity (so you could plug your electronics in one area and it would still work elsewhere in the country; our current American standard is 120V AC oscillating at 60Hz), and the expansion of the electricity grid across the Nation as well as the world. In essence, the AC current paved the way for centralized generation and consequent distribution and transmission of electricity to customers. 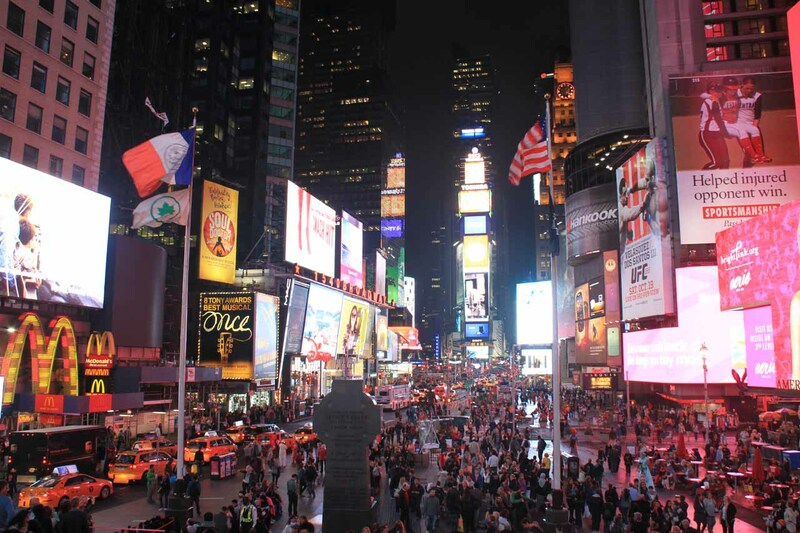 Thus, the energy utilities started to gain influence and power, which still remains to this day. Today, we take for granted that we plug in our electronics to the wall socket and get electricity to power our computers, chargers, TVs, lights, microwaves, refrigerators, etc. Yet it was a waterfall that was instrumental in the eventual adoption of our electricity grid, and thus changed our lives forever. Now while Edison ultimately lost the technological battle between AC and DC, he might end up getting the last laugh as environmental, political, and economic pressures are steering the electricity industry back towards de-centralized distributed generation (though not totally in favor of low voltage DC as Edison would’ve liked). This opens the possibility for clean renewable energy (solar, wind, geothermal, wave, etc.) to compete with energy utility monopolies for power generation and distribution (which is currently by coal-fired plants, natural gas, nuclear, and hydroelectric) by being more efficient, environmentally friendly, and cheaper. Whether this happens sooner rather than later largely depends on all the backroom dealings, money exchanges, promises, and debating amongst government and industry interests (this includes lobbyists and politicians taking money from industry) who make the decisions as to how the Nation moves forward on this matter. With the breakthroughs in electricity transmission and distribution highlighted in the section above, the world started to view all the major rivers and streams as potential for generating electricity. And sure enough as the 20th century progressed, almost all of the major rivers and tributary streams have been blocked by dams and tapped for hydroelectricity. 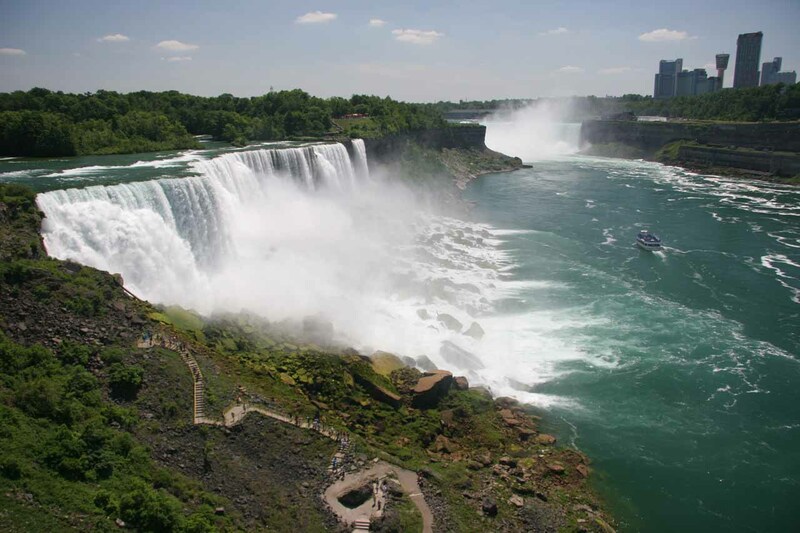 It was only natural to use Niagara Falls as the example and apply it to every other powerful river or waterfall to generate electricity where the moving water was one of the most prominent renewable sources of energy at the time. However, the developments that took place at Niagara also highlighted the various constraints that it was subjected to by interested parties. First of all, the falls was shared between Canada and the United States so there had to be agreements between the two countries to avoid conflicts. 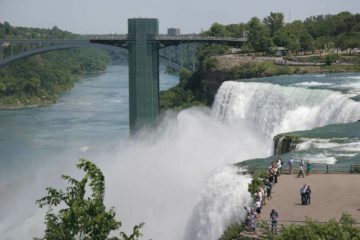 Second, it was already a major tourist attraction so constraints had to be made limit the amount of water to withdraw from the Niagara River for the purposes of industry. Third, environmental issues like the harsh winters, ice flows, floods, geology of the Niagara Gorge, etc. had to be accounted for in order to regulate where new hydro facilities could be built and how they could operate. It used to be that the American side of the falls were so overexploited that the underlying bedrocks were becoming exposed. The same was also starting to happen with the Horseshoe Falls. Eventually, treaties were made between Canada and US to legislate how much water could be withdrawn from the Niagara River to both ensure both the scenic allure and the advancement of industry. As it stands now, Canada gets to extract about 56,500 cubic feet per second of water while the US gets to extract 32,500 cubic feet per second. The discrepancy accounts for the fact that some of Canada’s power is to be sold back to the US. In peak season, the flow over Niagara Falls is nominally guaranteed to be at least 100,000 cubic feet per second during the day when the falls are most visible. However, this minimum is allowed to drop to 50,000 cubic feet per second at night time when the falls are less visible (so more electricity is being generated at night as a result). During the low tourist season between November and April, the minimum flow is maintained at 50,000 cubic feet per second 24 hours a day. 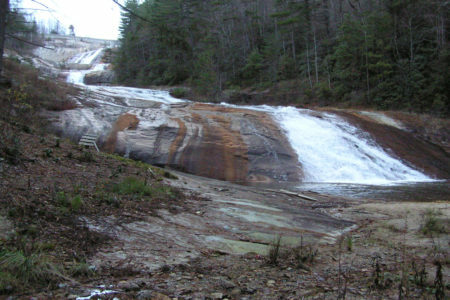 The regulated flow of water has the slowed the rate of erosion of the falls (and hence the movement of the falls upstream) at around 3 feet per year. This has the unintended effect of prolonging the life of the falls for our enjoyment (though this would take several thousands of years before the falls reaches beyond the hard rock layers and becomes rapids). You can read more fun facts about Niagara Falls here. 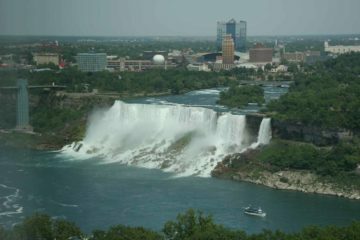 Given the amount of development that has occurred around Niagara Falls, its current role as an international attraction while providing power to much of the Eastern US demonstrates that landmarks such as this need not be totally sacrificed for industry. But given the natural tendencies of man to want to exploit for personal gain, one wonders what happens with the rest of the major waterfalls around the world. Well it turns out that the major waterfalls left just happen to be multi-national ones. For example, Iguazu Falls is shared between Argentina and Brazil. Victoria Falls is shared between Zambia and Zimbabwe. There are also lesser known and less powerful ones like Detian Waterfall, which is shared between China and Vietnam; and Kalambo Falls is shared between Zambia and Tanzania. I suspect the reason these waterfalls haven’t been sacrificed is because involved countries have to come to agreements as to how to harness the falls. You can see from the developments at Niagara Falls, this involves a lot of capital, experimentation, treaties, and rules and regulations. Had giant waterfalls been completely within the control of a single country or political entity, you can bet more liberties would be taken to exploit the water power. 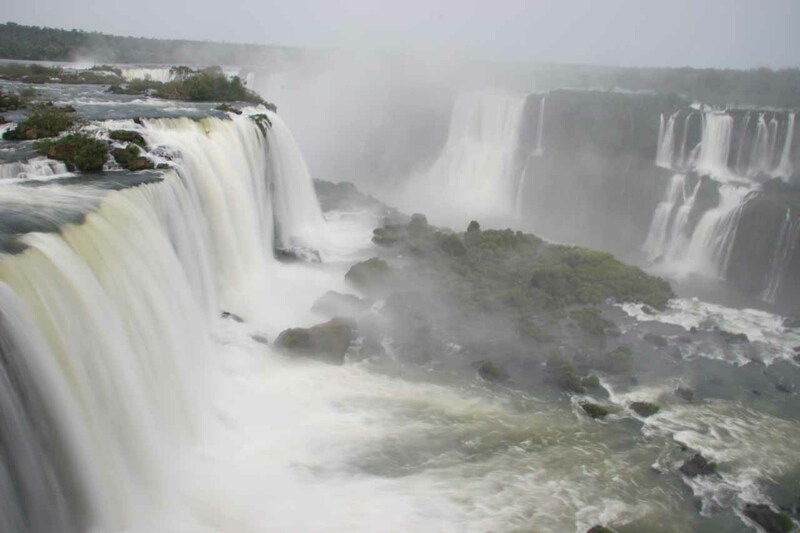 In the case of Iguazu Falls, Argentina pushes for the falls to remain an eco-tourism attraction while Brazil has already sacrificed the Sete Quedas Waterfalls (which would’ve given Iguazu a run for its money) as a consequence of the immense Itaipu Dam project. Thus, Iguazu rakes in tourist dollars instead and might be enough to offset any capital investment in transmission lines and hydro developments as well as international agreements to tap the falls for electricity. 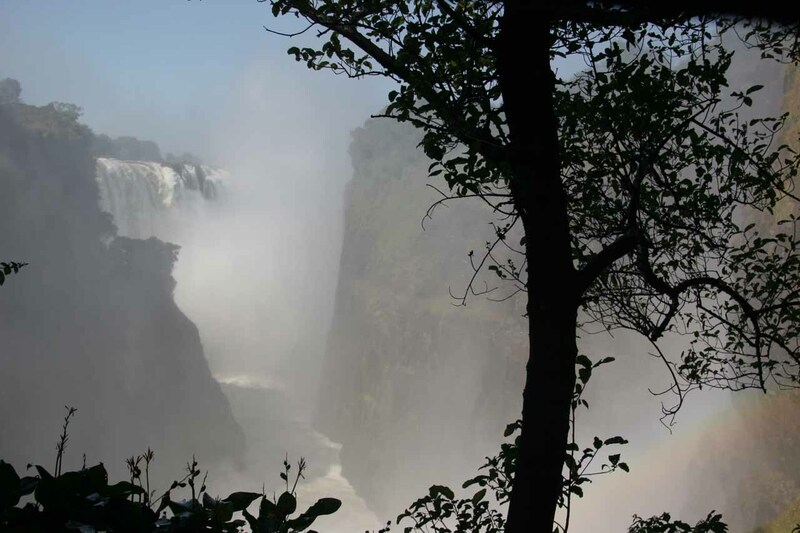 Similar concerns about capital investment and political stability might have also spared Victoria Falls from disappearing. Currently, only the Zambia side has hydro facilities (though they’re mostly out of sight from the tourist areas), but makes their side unimpressive and prone to exposing the vertical walls during the drier parts of the year. So in the end, geo-political boundaries may have saved the Big Three (Niagara, Iguazu, Victoria). But only time will tell how population pressures, energy needs, and political stability will influence the preservation or elimination of these world wonders. So given this historical perspective about Niagara Falls, it’s not hard to see why it’s the most famous waterfall in North America. After all, it has managed to strike a balance (albeit an uneasy one) between the scenic allure of Nature and the exploitation of its power for the advancement of technology and industry. More importantly, it’s also the waterfall that changed our lives in an inextricable and profound way. And while one may debate what the value of waterfalls is to society as a whole, the history tells us that Niagara Falls has demonstrated how a waterfall can impact the course of history, industry, and even conservation. 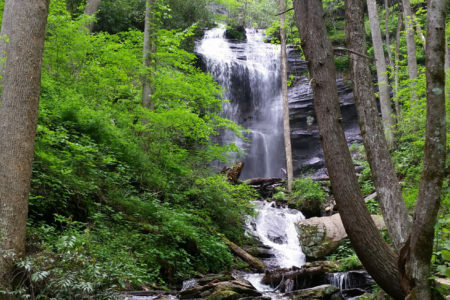 Maybe the next time you visit a waterfall, you may look upon it as more than just a pretty attraction!